Terri knew something was wrong with her health, but doctors couldn’t pinpoint the cause. When she came to Memorial Sloan Kettering, she received an accurate diagnosis — and had a surgery that changed her life. 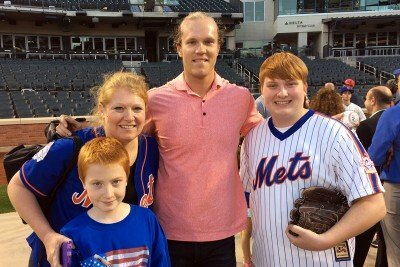 Terri with her sons Sean (left), Dan (far right), and New York Mets pitcher Noah Syndergaard. Terri was suffering from Cushing's disease when the photo was taken. Doctors had differing opinions as to why Terri Leno was feeling unwell. A chance meeting with a friend led her to Eliza Geer, a neuroendocrinologist at Memorial Sloan Kettering. Dr. Geer discovered that Terri had Cushing’s disease, and the two agreed on a surgical treatment plan. Terri had surgery in March 2017 and is on the road to recovery. The vague symptoms Terri Leno had been experiencing in 2014 led to a laundry list of diagnoses from different doctors — but no clear solution. Terri, a pediatric nurse and married mother of three from West Hempstead, New York, had put on weight and wasn’t feeling like herself. Every doctor she saw had a different root cause in mind: mononucleosis, fibromyalgia, multiple sclerosis, sleep apnea. The list went on and on. “I went from one facility to another, and the comparisons didn’t add up,” the now 44-year-old recalls. She thought she was getting closer to an answer when a doctor diagnosed her with hypoglycemia and put her on a strict diet. When the weight crept back on, Terri decided to see an endocrinologist, who did some blood work and saw something that raised his eyebrows. Years prior, Terri had been diagnosed with a pituitary adenoma, a benign tumor in the pituitary gland underneath the brain. But it hadn’t been growing, so doctors kept discounting its importance — even though that didn’t seem right to Terri. Terri was disappointed by the endocrinologist’s approach to care. Terri went back to her primary care doctor for more lab work. The results showed that her cortisol — a hormone that’s released in response to stress — and urine were abnormal, so her doctor sent her to a different endocrinologist. Terri had begun to suspect Cushing’s syndrome, a condition that develops when the cortisol level is elevated for a long time. When the rise in cortisol is due to a pituitary tumor, it is referred to as Cushing’s disease. But once again, Terri was met with resistance. That doctor referred Terri to yet another endocrinologist, who recommended genetic counseling to look for abnormalities at a more microscopic level. The genetic counselor whom Terri saw found no genetic problems and agreed that her case looked like Cushing’s. Terri went back to her most recent endocrinologist and advocated for herself. But thankfully, she would soon have relief. In early 2017, Terri was telling a friend about her health woes. That friend knew a woman, Lauren, who had been diagnosed with Cushing’s disease. The two women spoke, and Terri instantly found a connection. It's really essential that patients come to a place where it's very routine for us. Even though we generally don't describe this as a cancer, it's still a tumor, and patients need to achieve tumor control. “She was saying the same exact things that I had been thinking, feeling, and saying for three years,” Terri says. She knew she had to follow in Lauren’s footsteps. Lauren had been seeing Eliza Geer, a neuroendocrinologist at Memorial Sloan Kettering and Director of MSK’s Multidisciplinary Pituitary and Skull Base Tumor Center. Terri called to make an appointment with Dr. Geer, providing her office with 75 pages of medical records. At her first appointment with Dr. Geer, Terri knew she had come to the right place. Even though most pituitary adenomas are not considered cancerous, Dr. Geer was well prepared to take on Terri’s case. Dr. Geer suspected Cushing’s disease when she first met with Terri but wanted to be thorough in her approach. That was a job for MSK’s Multidisciplinary Pituitary and Skull Base Tumor Center. The center brings together neurosurgeons, endocrinologists, head and neck specialists, and other experts. All of the doctors work together to coordinate and deliver the best possible care for each patient. “I wanted to cry knowing I could have all of my testing done under one roof and that I didn’t have to call multiple doctors,” Terri recalls. Convenience for the patient is not the only benefit to a team approach to care, however, says Dr. Geer. Ultimately, Dr. Geer ordered one more test that gave her more insight into Terri’s cortisol level. When the results came back, Dr. Geer was confident that a surgery to take out the adenoma would dramatically help. In March 2017, Terri underwent surgery at Memorial Hospital. Neurosurgeon Viviane Tabar and head and neck surgeon Marc Cohen were able to remove the tumor through Terri’s nose in a minimally invasive procedure. Because it was an endoscopic surgery, Terri didn’t experience any bruising or swelling on her face. The results were just as Dr. Geer expected: A pathology report and Terri’s postsurgical cortisol level confirmed that she was finally in remission from Cushing’s disease. “Those values are predictive of a long-term remission, so it was an excellent outcome,” Dr. Geer says. Terri was thrilled to finally have the support she so desperately needed. Now, Terri visits Dr. Geer approximately every two months to make sure her hormone levels continue to stabilize postsurgery. Dr. Geer says that hormonal fluctuations can make for a challenging first year after achieving Cushing’s remission, but Terri feels well on her way to making a full recovery.